How smart people think about ROI. Somewhere along the way in my travels I picked up a reputation of being an “anti-roi” guy and I am here today to tell you that you got me all wrong. 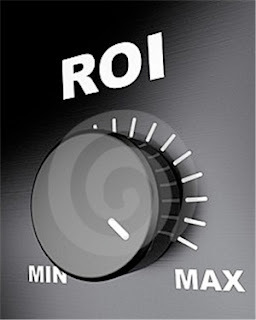 I think more about ROI then you could imagine. The difference between you and me may be that I only care about the metrics that meet my company goals and I don’t care much about the metrics that everyone tells me I need to care about. If you buy a book on metric measurement or listen to a speaker talk about the importance of ROI Metrics they will speak to generalities and “Best Practices” and not know, understand or meet your unique objectives. To further make my point, here is a panel I did at SMartCamp last May in NYC. The beautiful Julia Kaginskiy (moderator) pitted myself against Israel Mirsky (Porter Novelli) to discuss the value of Metrics. He is a smart numbers guy who makes an excellent defense but still had no real response to my analogy of not using metrics to get pretty girls to make out with you and if I had to pick a clear winner I think it was me (by decision, no knockout) due to the fact that like this blog post you need to know your audience and decide what goals are the ones that match them…not what people tell you are the standards. Cool post Saul. There is definitely a difference in doing analysis of social media and, say, a landing page split test. The latter has clearly defined goals and metrics, while the former is fuzzy, by nature of it being social, but is still vital in a web marketing strategy. As for sentiment analysis, we are at around 75 to 80% accuracy these days, something you should talk to a guy named Ben Coe about.